This is a great sauce for meat or any kind of kebab. It has so much flavor. It is also sometimes referred to as coriander sauce, but coriander is the seed of the cilantro plant. This sauce is made with cilantro leaves so I call it cilantro sauce. It tastes great room temperature or cold. 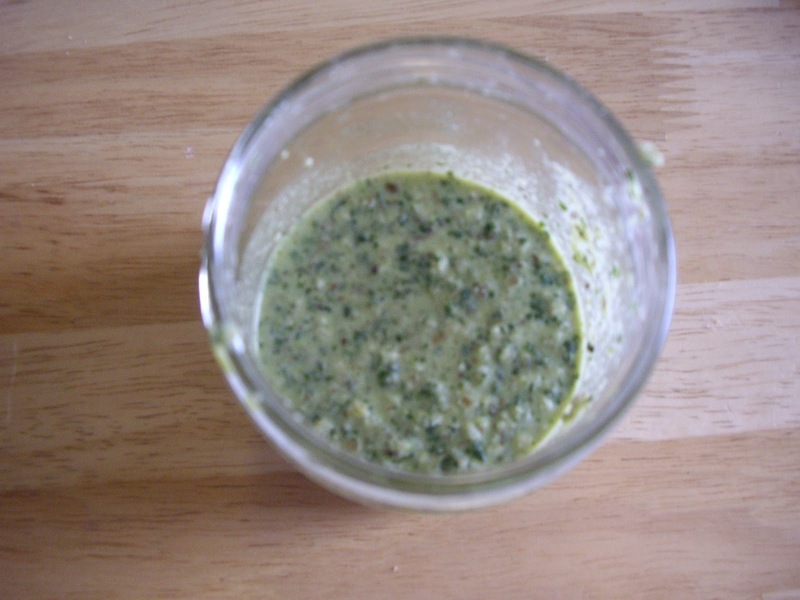 Stick the cilantro, garlic, pepper, walnuts, lemon juice, salt, pepper, and cumin into the bowl of blender or food processor. Turn it on and get the mixture as much into a paste as you can. You probably won’t get it completely smooth and you may need to stop and scrape the sides a few times. Take the mixture out and put into a jar and add a couple tablespoons water. Stir well. If it is the thickness you want, good. If you want it a bit more pourable, add another tablespoon or two. Taste and season with more salt if needed. This is very intensely flavored! So much that it may surprise you. You might call it tart. This makes about a cup. Serve within 4 hours of making and refrigerate any leftovers.